Hello ... it is Music Monday on a Tuesday today. A reader recommended the Seattle band The Head and the Heart to me a little while back and they just came out with this new video for the song 'Lost In My Mind' yesterday! I enjoy how they play to multiple lamps in the snow and I really like their vibe and sound. Tell me what you think. I love TH&TH! Living in Seattle I've been lucky enough to see them 3-4 times in the last year. They are such a fun band and even more fun to see how far they've come. Too funny - they are my music pick this week too! I just wrote the post yesterday and will publish on Friday. I am loving them too! This band is so awesome. I saw them at a small show a little while ago and the amount and quality of sound they put out was stunning. It's funny, I saw them open for Dr. Dog at Terminal 5 in NYC a couple weeks ago, then last week I heard them on the radio for the first time, and now they're on your blog. I like them more and more each time I hear them. I love this band! I'm so glad someone recommended it to you and in turn you've recommended it to me! Love this song. The band is new to me but so glad I found them. Love the Head and the Heart! They are the reason I added a music section to my design blog. So happy to see the many fans they have now. Thanks for sharing the new video! Yay for THATH! I can't believe how big they've gotten in the last few months. I mean, their video premiered on MTV! Tickets for their April 29th show in Seattle went on sale a few weeks ago, and they sold out in LESS THAN 30 MINUTES! Amazing. I'm glad to see their recognition is expanding outside of the PNW, but am sad their days of small, intimate shows have probably come to an end. Ohh I didn't know about the new video! 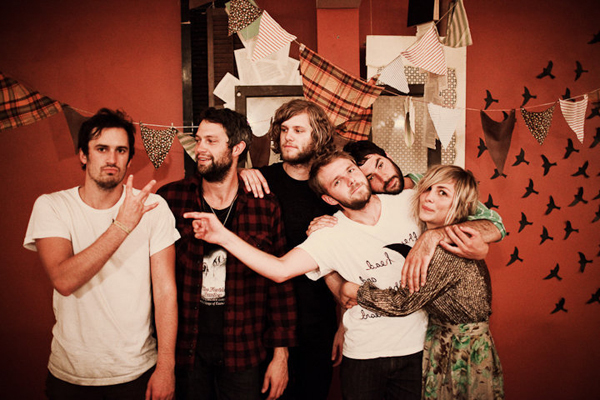 Love the Head and the Heart. Thanks for sharing! We love Head and the Heart. We live in the Seattle area and have enjoyed watching them grow and thrive as word gets out. We are seeing them in the next couple months, but I LOVED watching them at an acapella concert last year performed in an Abbey. Pure harmonies. Sigh... it was magical. great song! I'd never heard of this band before...I like your music Mondays. I LOVE HEAD AND THE HEART!!! !.....last october my husband and I were in Seattle visiting a friend and she said let me stop by the record stor and get a cd of a friends of mine's band i have been meaning to pick up...enter the Head and the Heart...she put it on in the car and at once I was in love! I brought them to KANSAS. I would discribe them as a perfect child of Josh Ritter and Damien Rice.